The Australian Government has committed to contributing towards the international Open Government Partnership (OGP). This is awesome on so many levels. In particular, it is recognition that working openly and collaboratively facilitates more ethical, transparent, effective and efficient government. My assessment is the Australian Government National Action Plan is based on solid principles and goals, but implementation recommendations are still relatively immature. It is as if experiences so far have been based on small pilot projects and small groups and is yet to hit the challenges associated with scalability, reliability, maintainability and interoperability. Australia has an open by default policy for government data. A great first step, but of minimal value until the data is readily usable. Yes, a bus timetable is useful when a paper copy of it is distributed to commuters every 6 months. But it is super useful when bus timetables are integrated with real-time bus and traffic data travel plans can be adjusted accordingly. This is facilitated by the concept of "mashable government" where government data is made available in machine readable form via standards based Application Programmer Interfaces (APIs). Cross agency integration of datasets can open up significant value, but usually requires addressing of technical, financial, legal and social challenges. Agencies need to agree upon common formats for common datasets (typically through use open standards). Who benefits from aggregated datasets is usually different to those who collects and maintains the data. As such, solving integration issues often requires creative, cross-agency, business cases to be crafted. The National Action Plan should discuss: Mashable Government, APIs, use/extend/create open standards (in that order), writing business cases to identify high value datasets, and cross-agency funding of data management strategies. There has been good progress in bi-directional communication between citizens and government. There are now excellent tools to run YES/NO polls past many people to gauge community sentiment. Who will fund "trusted experts" to research and advise on complex issues so they can make informed decisions? How can a community vote on complex subjects? How do you address the signal-to-noise ratio within community discussions? How to compare long term value of open source and proprietary business models. How to assess the health of an open source community and associated rate of innovation in order to properly assess the value of open source. How to assess a product's claims of standards compliance. Some companies dissuade standards use by pricing extra for standards use, or limiting standards based functionality. How to assess the quality and applicability of a standard, and whether to invest in influencing the development of the standard. Typically government officials have mandate to solve department-wide problems, however open source and open standards based solutions will often be best justified at a Whole-Of-Government, or Whole-Of-World level. One particular argument is "If I invest in an open standard, or open source, I will see minimal immediate benefit, but long term will see international adoption which will lead to advancement of my local goals." Government's asymmetric spending of discretionary budgets at year-end disadvantages fee-for-service business models typically employed by open source businesses. My perspective is based upon decades developing software, including working within large defence software programs, integrating data from different organisations within web based spatial data infrastructures, writing open source software and building open source communities, developing open standards and defending open standards against vested interests, writing business cases and policies around open source adoption, and building systems based on open source and open standards for Australian government. 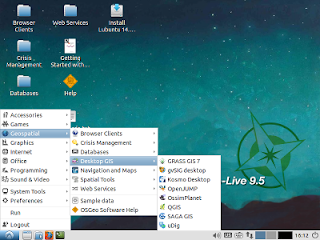 The OSGeo Community has released the latest OSGeo-Live reference distribution of geospatial open-source software, version 9.5. 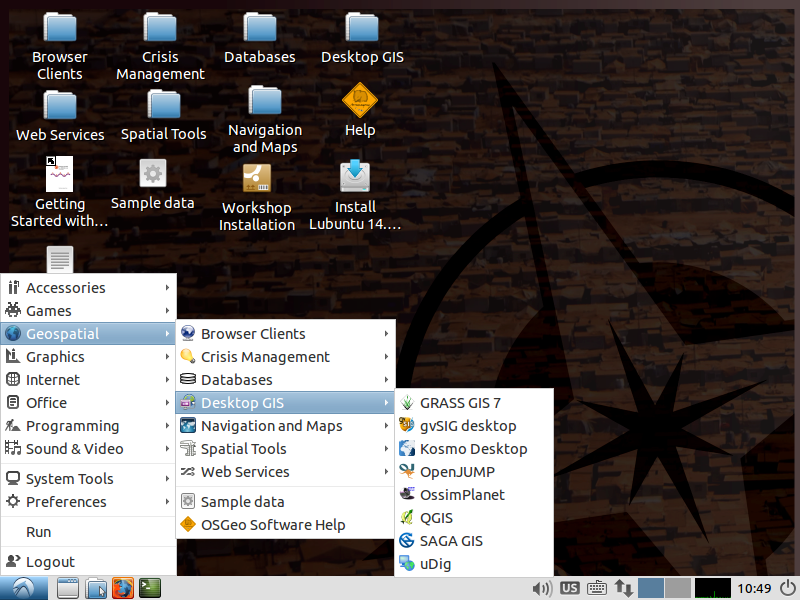 Once again, people across the globe can depend on OSGeo-Live to provide robust, ready-to-use installations of all key open source geospatial applications, along with overviews and examples. "With two new applications added, 22 applications updated, all based upon 8 years of continuous developments and refinements, we believe this to be our most stable, usable, and feature rich distribution to date", said Angelos Tzotsos, OSGeo-Live build manager. "We are pleased to be seeing steady increased adoption of OSGeo-Live from educational programs, complementing the already wide use at geospatial conferences and workshops", said Cameron Shorter, one of the OSGeo-Live coordinators. QGIS 2.14 LTR with more than one hundred new features added or improved since the last QGIS LTR release (version 2.8), sponsored by dozens of geospatial data providers, private sector companies and public sector governing bodies around the world. GeoNetwork 3.0 with a brand new user interface and a bunch of new features. MapServer 7.0 with many new features, including improved complex filtering, labeling performance and ability to render non-latin scripts. 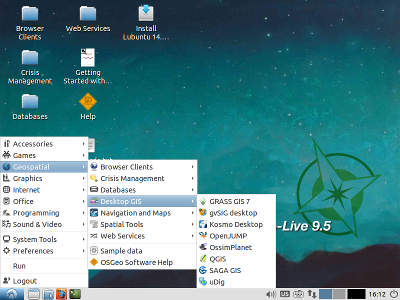 OSGeo-Live is a self-contained bootable USB flash drive, DVD and Virtual Machine, pre-installed with robust open source geospatial software, which can be trialled without installing anything. Based upon the rock-solid Lubuntu 14.04 LTS GNU/Linux distribution, combined with the light-weight LXDE desktop interface for ease of use. Run Quickstarts and verify they still works as described, complete. Update review status in our spreadsheet. (It really helps us know that an application has been reviewed, and by who). Translate docs that have been updated.